Sour Cream Apple Pie: When sliced apples are nestled in a custard-filled pie and piled high with giant crumbs, could you possibly choose pumpkin over apple pie? Given the choice of pumpkin pie or apple pie, I always choose apple. Always. It’s almost as if there is no need to make a choice. Pumpkin pie to me is just meh. 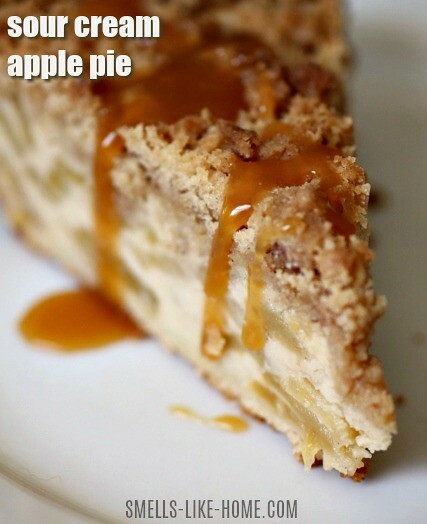 But apple pie…how could you not love it? Sweet, tart, buttery…apple pie is the pie of choice for most of us. But can you believe I’ve only made it once? And that was years ago for a church fair where I didn’t even get to taste it! So when Kyle and I went apple picking earlier this fall, I decided it was time to make some pie. I couldn’t go traditional though. That would be too…conventional. 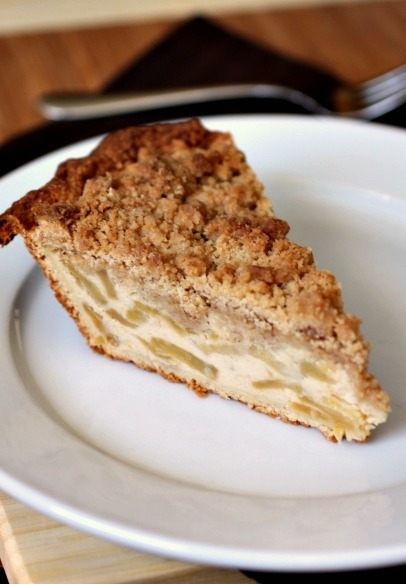 I found this Sour Cream Apple Pie recipe in one of my newer cookbooks and was immediately sold. It’s got a crumb topping. Turns out this pie is very much like the Peach Cream Cheese Tarts I made over the summer, with a baked custard filling with apples floating throughout the custard. I loved those peach tarts and I loved this pie. Did I say that it’s got a crumb topping? Yeah, it’s got a crumb topping. And I’m not talking about one of those toppings where there isn’t enough to cover the whole pie…this one has plenty of crumbs – big crumbs like you’d find on a good NY crumb cake. You’ll see by the directions below that this is a really easy pie to make. There’s no stress about whether the apples will be soft enough or if the filling will be thick enough – everything works out beautifully with this pie! 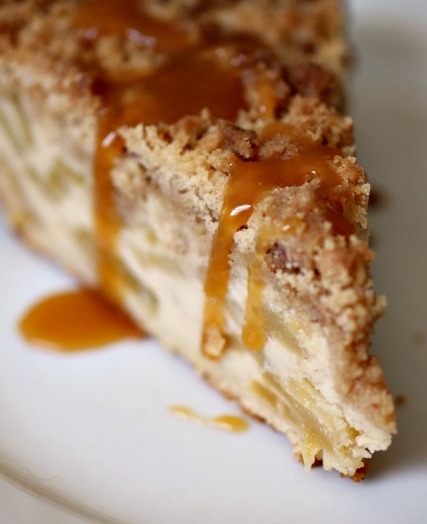 So tell me, will apple pie make it to your Thanksgiving table this year? Set a rack on the lowest level of the oven and preheat to 350° F. Roll out dough on a well-floured surface and transfer to a 9-inch pie dish, crimping the edges as desired with fingers or a fork. To make the filling, place apples in a large saute pan with butter and sugar. Cook over high heat, stirring and tossing, for 5-7 minutes until about half of the apples have dissolved. Transfer the apple mixture to a bowl to cool. To make the custard, whisk together the flour and sugar in a bowl, then whisk in the eggs, vanilla, and sour cream in that order. To make the topping, mix the flour, sugar, baking powder, and cinnamon together in a bowl. Pour in the melted butter and stir until the mixture forms a crumbly mass. Stir the cooked apples into the sour-cream custard filling and pour into the dough-lined pan. Sprinkle the crumbs over the filling. Bake the pie until the dough is baked through, the filling is set, and the crumbs are a deep golden color, 50-60 minutes. Cool the pie on a rack. This pie is served best when completely cooled at room temperature. I love that texture this cake has. I agree, I’m not a huge pumpkin pie fan. This sounds great! Definitely has a nice moist and rich look to it. I always go for the apple pie as well. 😉 Lovely pie and what a neat filling. This looks wonderful! Love the sour cream custard! I should not have clicked on this post before lunch. Now all I can think of is PIE. This looks absolutely delicious.. 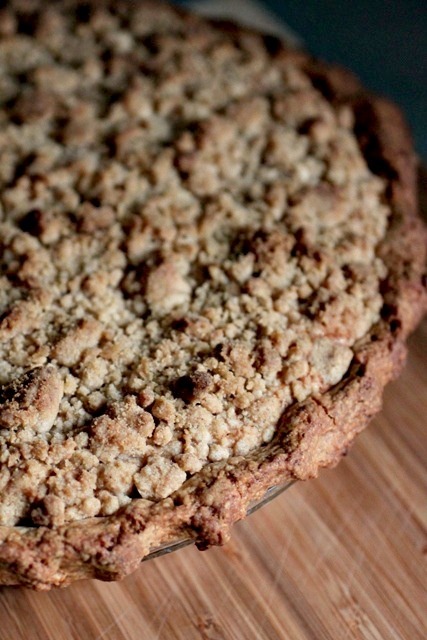 I love crumble top pies! I am bookmarking this and making it sometime in the near future. Now, I’m dying for apple pie. I love this recipe with the sour cream custard filling. So great to hear! This pie is delicious!